When you talk about Agile, executives always want to know if their investments are paying off for the organization. Can you measure and prove that being Agile provides faster time to market, helps cut costs, and drives revenue? It's not uncommon to hear about organizations struggling with Agile. Many are a year or more in and just aren't seeing the amazing results they expected. Some are even seriously questioning whether the investment has been worth it. 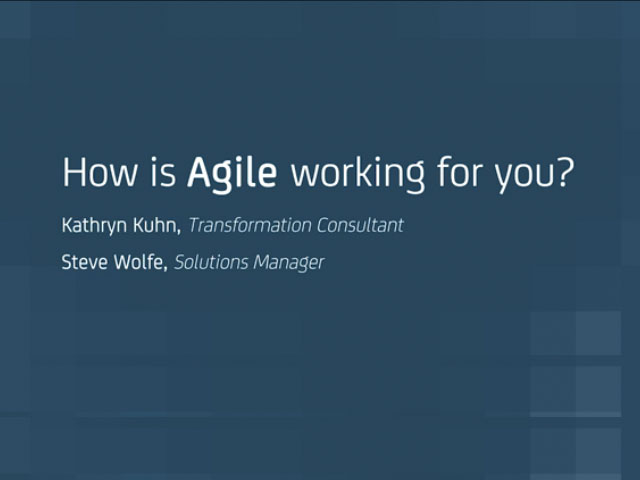 Watch Kathryn Kuhn, Director of Services discuss common failures and highlight real-world Agile success stories. You'll leave this webinar knowing how you can achieve amazing business outcomes with Agile. Title: How is Agile Working for You?